I grabbed the most flowery cross we own and hung it up over the desk. It’s a tad lower than I’d like it, but I’m not about to nail yet another nail into the wall – this apartment has plenty already. From left to right, I’ve got a Bible, my new Catholic Psalter to try out, and a breviary I compiled. A breviary is just the offices of Morning, Evening, and Night Prayer together in one book. I assembled my own because I wanted to use stuff from two different BCP’s, and I don’t like shuffling books around during the Office. Having a separate psalter is enough already! 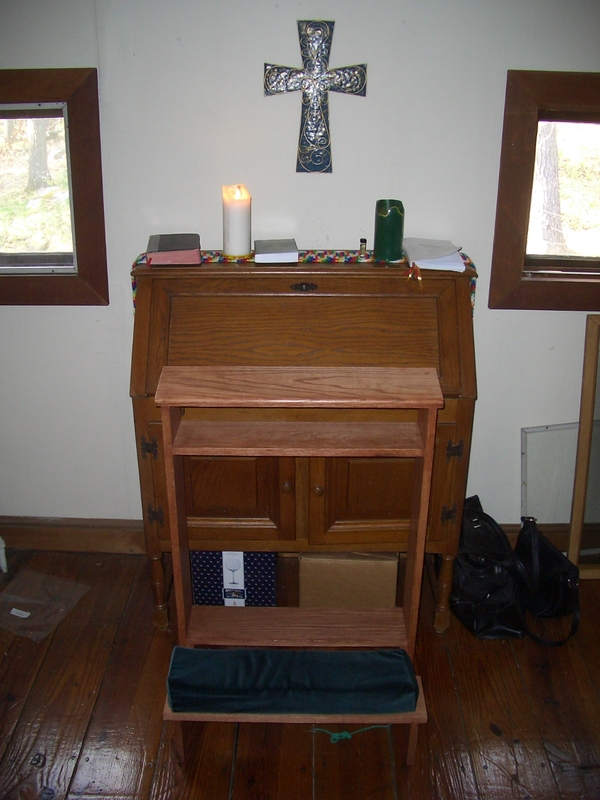 I also put my vial of anointing oil back on the desk. During Lent I kept it aside, but the resurrection theme of Easter seemed to be a good reason to bring back the oil used in healing prayers. On an unrelated personal note, that kneeler has been changing my morning tea-drinking habits. Typically I drink tea from a fairly large mug, but the ones I usually use don’t fit on the kneeler’s shelf, so if I want to sip tea while saying the prayers I have to use a smaller (normal-sized) mug. This entry was posted in Devotional and tagged art, Easter. Bookmark the permalink.